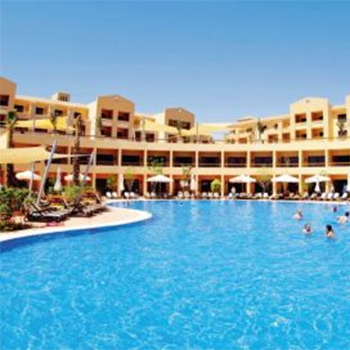 The Coral Sea Aqua Club, Formerly known as Coral Sea Splash Resort, is a 4 star hotel situated in Nabq just 2 minutes from a range of bars and restaurants. Just back from a cracking fortnight at the Coral Sea Aqua Club. We are a family of 3, and traveled with Thomson on 2nd August 2013 from Newcastle. Arrival at Sharm airport was fine and the transfer time was only about 20 minutes, including a drop off at another hotel. The hotel itself is well placed off the main road through Nabq, and only a 10 min walk from the beach/seafront. Hotel check-in was fine and we were greeted with a drink, and given our all-inclusive wrist bands, then we were driven by golf caddy to our room, with our bags following shortly after. Our room was a swim-up room, and it was brilliant. Ours was on the 'sunny side' which had the sun from early morning until late afternoon - the other side lost the sun around 2pm. It was brilliant having daylong access to a more private pool. There is also a terraced area which gets sun all day, away from the crowded areas at the main poolsides elsewhere. The room itself was great - spacious with a large king size bed for us, and a smaller bed for our 9 year old. The room has a flat screen TV with movies channels, kettle & tea coffee making sachets (replaced daily), and a fridge/mini-bar (charges for mini-bar stock). Two large bottle of drinking water are provided daily too, again for Free. There is a hairdryer in room, and an iron/ironing board can be requested free from reception. Our bathroom had a shower, wc and basin... and oddly enough, a phone next to the toilet. Rooms are cleaned daily (unless you request otherwise) and if you are lucky, you may receive a surprise on your bed in the form of towel-art. The waterpark onsite is brilliant too. There are 3 matslides, and a freefall slide, as well as 3 rubber ring slides - the Inner tube, the space bowl and the Boomerang. There is a pirate ship kids waterplay area, a wave pool and the flowrider surf machine. We did of course, try them all!! There are a few areas around the pools and in our room which looked a little 'tired' and in need of some maintenance, but nothing major and nothing to spoil anything. Our rooms were next to a building development, however there were no works ongoing when we were there, so no noise. There are bars around the pools for drinks, and some that do snacks. The main bar areas are also very good, and the service excellent. This was our first 'All-Inclusive' holiday, and we couldn't really fault the food. Our son is normally a fussy eater on holiday, meaning we resort to McDonalds to feed him, but he always found something he liked to eat at this hotel. The meals were all buffet style, and evening dinner is themed each night, and there was always a good choice. There was also two A La Carte restaurants; an Asian diner and an American Diner, and we received one visit to each per week as part of our all inclusive package with Thomson - these just needed to be pre-booked before you visited. There is a also a Stonegrill restaurant next door to the hotel, but still part of the hotel. Whilst not part of your All Inclusive, you do get 25% discount for being in the hotel. The food is served on a 400 degree heated stone, and cooked in front of you, to your taste. Its well worth a visit. The staff at the hotel are brilliant, and all very friendly. There are also a few shops within the hotel - a clothing shop, sweet/toy/souvenir shop, a jeweler, a handbag/watch shop and a perfume/oil shop. The handbag/watch shop is worth a visit just to meet 'Mr Bean' who works there... "Which one, which one". We took sterling cash with us, as the exchange rate is better in Sharm than in the UK. You can change money either at reception, or at an ATM near the shops int he hotel. We found the rate better from the ATM than from reception though. There are also banks outside the hotel, where you can change money too. The Thomson entertainment team are brilliant, and work their socks off. They organise games and activities around the hotel complex, and in/around the pools, if you want to get involved. However, some of the evening entertainment was a little hit and miss, and some evenings the main entertainment didn't appear, and they had to fill in. They do a nightly 'Tea-Time Live' show for the kids, which they all loved. We only booked two trips with Thomson - 'Soho Square shopping', and 'Market Mayhem'. Soho square is worth a visit - fixed price shopping (slightly more expensive), in a new shopping area near the airport. There is also an ice rink, cinema, open air stage area with entertainment and musical fountains. Market Mayhem was at the old Market area of sharm, and while the trip takes you to 3 or 4 fixed price shops (better bargains than soho sq), you do also encounter the hassle of traders trying to get you into their shops at every turn. We had hoped to do an excursion to either Cairo or Luxor, but with the troubles at the moment, we were unable to do them with Thomson who had cancelled those trips. I believe other local tour companies may still take you, but we felt it wasn't worth the potential risk. As far as the trouble go, we had one evening where a nationwide curfew was in force (7pm-6am) where we were advised to stay within the hotel complex, but this was lifted fort he sharm/red sea areas the following day. Other than that, you would not know there were any issues. Sharm remains a safe place which (hopefully) doesn't become affected by the political situation elsewhere. There are loads of bars, restaurants and shops along the main strip through Nabq, but most of the shops will try and engage you in conversation and hassle you to buy from them. There is a large supermarket called 'Metro' which was very good for buying sweets/snacks/drinks. There are also McDonalds, KFC, Burger King, TGI Fridays, Starbucks and Hard Rock Cafe all within a few minutes walking distance of the hotel. Overall, we loved our stay at the hotel, and the resort and would definitely go back, and recommend it to others. Its official rating is 4 star, and I think its fully deserving of that rating.